Did you know that Monday Morning Flower and Balloon Co has been providing flower and balloon event decor for over 30 years? Why hire a separate florist and a balloon decorator when we do it all! 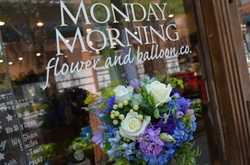 Monday Morning Flowers was founded in 1988 in the Princeton, NJ area. Owned and operated by Georgianne and Kevin Vinicombe, they lead store operations along with a very talented team of floral designers, sales staff and delivery personnel. We are a full service floral shop specializing in Balloon and Floral Event Designs. With 4 vans and trucks on the road 7 days a week, we are easily assist with hundreds of both corporate and social events every year. Serving most of New Jersey, Philadelphia and Lower Bucks County with creative, festive balloon event decor is our passion. Festive balloon arches, centerpieces and columns give you a lot of bang for your buck. Let Owners, Georgianne and Kevin Vinicombe along with their talented staff treat you to courteous, timely and professional service at reasonable prices.